Finally (with plenty of encouragement from friends and family), I’m painting again! As you can see, I have been working on Santa’s hands – one holds a glass of milk, while the other holds letters from children all over the world. I feel as if these hands tell the whole story of the developing painting. 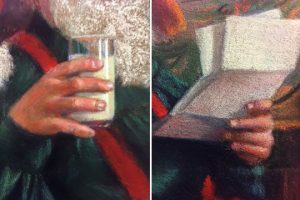 I wanted to show you these small sections of the painting so you can see the great detail that goes into it. As you may already know, the medium I work in is soft pastel chalks. Everything I paint is in chalk. It’s not like the blackboard chalk you might be thinking of – pastel chalks have the same pigment as oil paints but with a dry binder instead of oil. This is why my pastels look like oil paintings! Each hand took me over three hours to paint. I may be a slow painter, but I believe this makes sure the finished product is the best it can be. As I get closer to the finish line, I’ll go back over each part of it and add more detail as I orchestrate all the elements of the final painting. So far I don’t have a title for it, but ideas are coming to me as I paint. Any thoughts? I also wanted to let you know I’ll be introducing some new gift ideas for the Fall and Holiday Season. They’re not on my website yet, but you can be one of the first to see them if you visit me at the Night Market in Market Square. I’ll be there tomorrow (August 18th) and next Saturday (August 25th) from 5 to 10 pm. Stop by and see what’s new for the holidays! 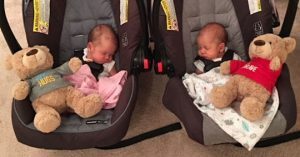 One last thing… what kind of Grandma would I be if I didn’t share a Twins’ update with you this week? They do a lot of sleeping, and sometimes it feels like I hardly ever get a chance to see them with their eyes open! But they’re growing and making lots of progress, and they’ve been pretty easy on their mom so far. Big sister Aria loves hugging them and blessing them with a kiss. Have a great week… and don’t forget to come see me at the Night Market!